This is a major change giving you total control over what appears on your invoices and credit notes. This feature has been developed in response to a number of requests and we believe it is one of the most powerful and flexible invoicing applications around. We're super excited to share this with you! The option to create multiple templates allowing the printing of Divisional Invoices, Delivery Notes, Foreign Language Invoices, etc. If you would like to try the templates out, simply navigate to Settings and click on the Branding and Templates link. 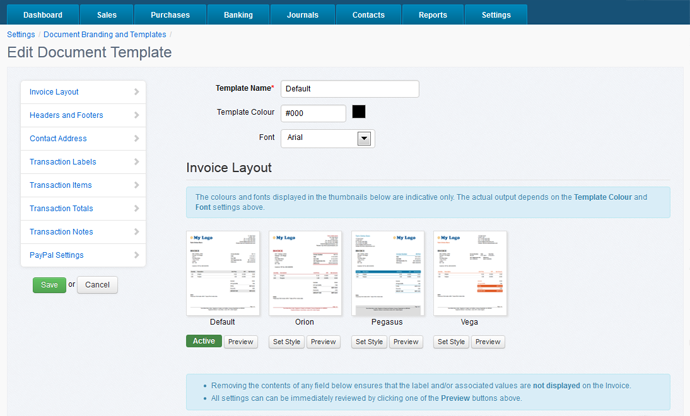 We have already created a default brand template for every organisation with your previous settings in AccountsPortal. To get started, click on the Add New Template button or edit the Default template and try out some of the settings. You can easily Preview your changes from within the template before saving. New invoices may look marginally different compared with invoices generated prior to this release. We encourage all users to test print their next batch of invoices before sending them to customers. Logos have been resized in some cases. If you need to improve the quality of your logo, you can upload a new version at any time - we recommend using as large as logo as possible (preferably larger than 350px x 100px). The new features are only relevant to Invoices and Credit Notes - Statements and Remittance Advices have not been impacted. Future releases will include ability to manipulate the CSS for advanced users. If you have any feedback, please post some comments here or create a support ticket.